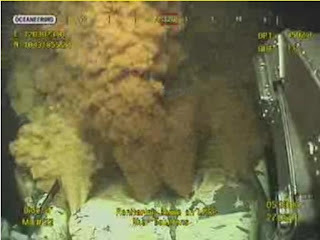 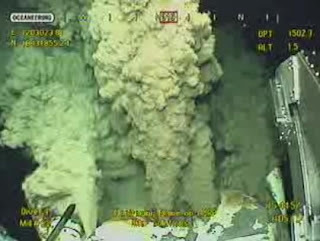 I am putting up these pictures to show why I believe that the injection pressure of mud into the well has dropped, indicating that BP have filled the well, and are now holding pressure to see if there are any problems. I would assume, if none develop, that they will inject cement to seal the top of the well, sometime today. 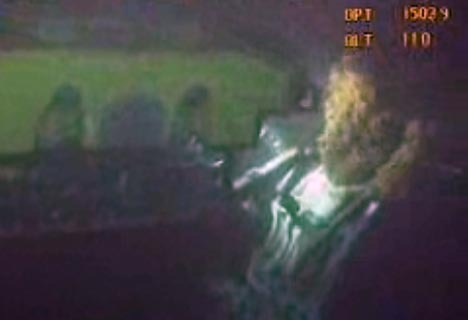 And I am slightly modifying the order since, at 6:35 they showed the ROV and the leak to give you some sense of how close the camera is to it. 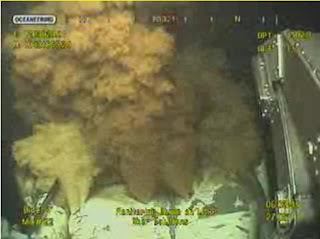 Notice how the flow was longer and straighter, indicating that it was at higher pressure (velocity) and that now it blows out at much closer distance, meaning it doesn't have the same pressure (velocity). There is a small caveat, and that is that I am assuming that there hasn't been any significant erosion of the surface of the cracks between the two shots, and that may be a possible change, though not enough to cause the reduced throw distance of the central jet.